I can take or leave power shots. Chaos on the courts can make it hard to spot ball. 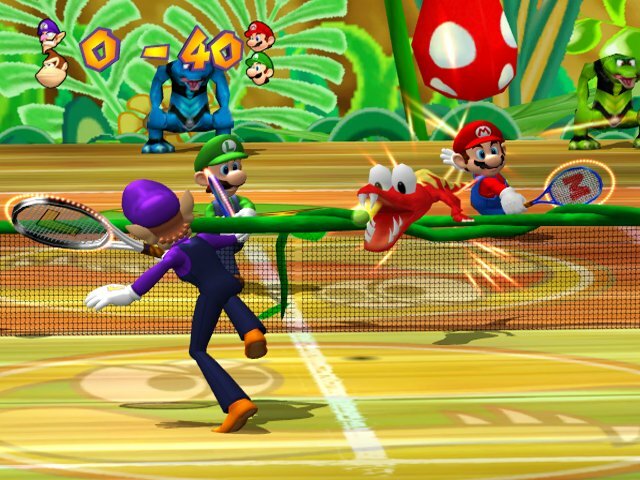 Outside regular tennis that generally takes place on the Peach Dome trio of grass, clay, and hard courts, there are gimmick courts which add a flavor of Mario's fantastical elements into the sport. 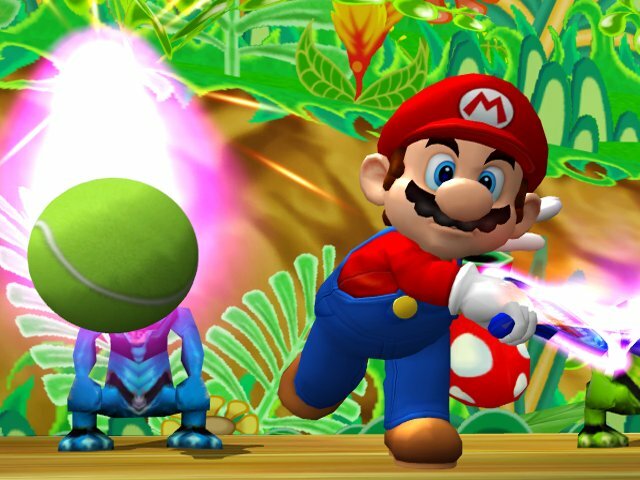 The Luigi's Mansion court is haunted with a plethora of poltergeists which will attack their victims, slowing them down, as well as throwing slippery banana peels all over the playing surface to trip up players. 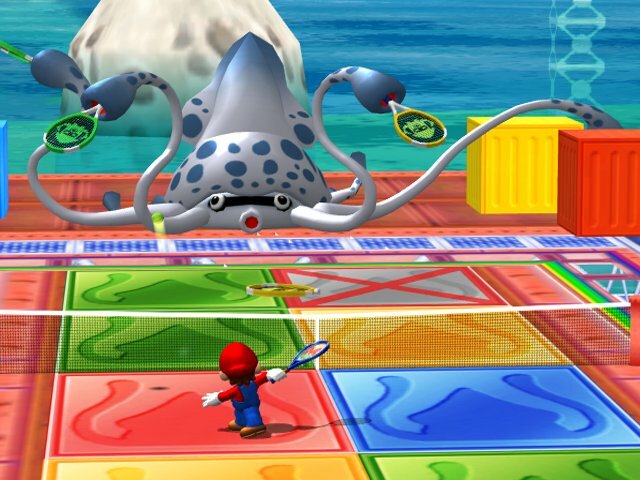 Meanwhile, the Gooper Blooper court hanging above the waters of Super Mario Sunshine's Ricco Harbor has sliding floor panels which move once a ball hits them, revealing holes. If a ball hits these holes, the ball is considered "out" and your opponent gets the points. Another example of a gimmick court is the DK Jungle court where the always-annoying Klaptrap enemies from Donkey Kong Country will attach themselves to players, slowing them down. There are a total of ten courts-- including the three variants of Peach Dome-- to play on. Apart from typical tennis and the aforementioned eccentric modes come Special Games. These put your numerous tennis abilities to the test in various scenarios. In Artist on the Court, you hit multiple colored paint balls into a wall in an attempt to paint a mural of a character. Hitting shots accurately to touch up various portions of the painting is key to getting a good time. Meanwhile, Gooper Blooper Volley is a test of endurance as you hit back all of the shots of the titular boss enemy. If you miss a shot or hit a ball onto a space marked with an "X", your game is over. There are eight or so Special Games to play, some of which need to be unlocked. Each game has multiple levels to play, with each level becoming increasingly more difficult to complete. Usually you have less time to score more points or some other kind of stipulation that is against you. 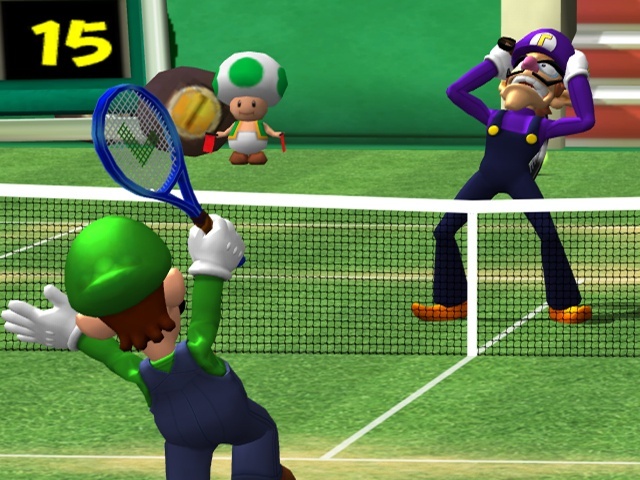 Mario Power Tennis runs at a steady framerate in order to keep up with the fast and frenetic action of the sport. Characters are modeled well, and the courts are lively in the background and foreground. 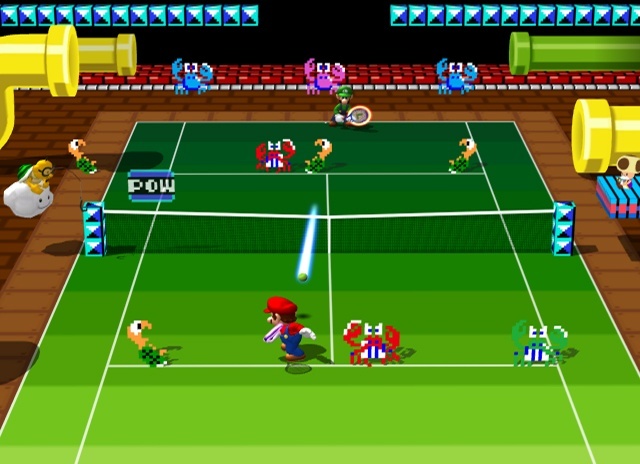 The game can become cluttered with too much color at spots which may blind some players or make it challenging to see where the ball is. The voice work isn't too grating, and the soundtrack by veteran composer Motoi Sakuraba fits the happy-go-lucky realm of the Mushroom Kingdom quite well. The opening cutscene is also highly hilarious to watch if you enjoy lighthearted fare.